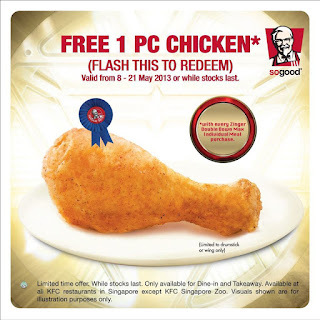 Singapore Freebies: KFC: Free 1pc Chicken (Drumstick or Wing) Giveaway!! KFC: Free 1pc Chicken (Drumstick or Wing) Giveaway!! KFC offers high quality and great tasting food in a popular array of complete meals such as Snackers, Ultimate Boxes, Roasta Burger, Egg Tarts, Daily Savers Meals and Family Feast that enable the whole family to share a fun and satisfying experience with all the affordability and convenience of a Quick Service Restaurant.